Oh, my beloved Jonathan, you’re one of my favorite people and when you turn 30 it’s a really big deal; but what can I do to honor you and accurately portray how I feel? I wish I could have hopped on a plane to see you in Atlanta for the real celebration; but, sadly, I’m broke and we live in entirely different parts of this great nation. We didn’t have much time together in high school before we graduated in 1998; but we kept in touch — even though we went to college far, far apart — which surely must have been FATE. I have fond memories of the 69 Boyz blaring from Javy, which is what you named your car; and you said it hurt your heart when pictures of me surfaced at a Florida Gators bar. You listened to me freak out in a parking lot when a teetotaler caught me with a bottle of wine; and you helped me unearth a pink bikini in Miami that — shockingly — looked fine. You were my date to a wedding when there wasn’t a straight boy in sight; and then I bowled barefoot and passed out on you in the car home that night. You’ll always be my buddy Jenelope; even though (or directly because?) you’ve never big-worded me. So here’s to another decade I know will see you in good stead; Love — one of your biggest fans! — LaFred. Well, it wasn’t *quite* as joyous as, say, the bundles that Christina and Nicole brought home this weekend, but…I finally joined the ranks of the KitchenAid mixer elite…(which is perhaps roughly equivalent in certain circles). Yes, it’s true — I finally settled on a color. (Sorry, Anonymous…I did Empire Red. It matches a lot of the stuff I already have!) 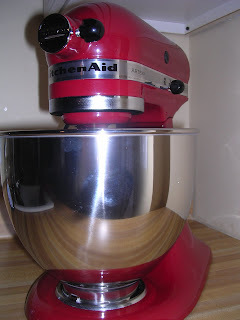 And as I was leaving the store with Big Red in tow, I was certain I was getting knowing glances from shoppers recalling when *they* first brought home *their* mixers. Some of them just smiled…but others said things like, “I love mine!” and I felt kind of like I had joined a special foodie club. I’d like to say that the inaugural run was something truly spectacular…but I was actually expecting to be snowed in today and was huntin‘ for some good, old fashioned comfort food when I came across a Paula Deen meatloaf recipe that is too embarrassing to name specifically. But maybe if I paraphrase her “I’m not your dietitian, I’m your cook”-quote, you’ll understand that this was one crazy meatloaf and I might actually have a heart attack and drop dead any minute now. I also don’t know if it was the mixer (or maybe I was caught between the moon and New York City? ), but I felt rather daring and didn’t follow the recipe to a T.
First off, I couldn’t find a can of fried onions. (Do they make them anymore??) But…it seems like every recipe I ever make always starts out with sauteing onions and garlic, so that’s what I did. I also didn’t use mayo because I don’t really *like* mayo (my sister, who is the exact opposite of me in sooo many respects, liked it so much when she was little that she could eat it out of the jar with a spoon). I also added a crapload of carrots and parsnips because I got to take some home from work the other day and I didn’t really know what to do with parsnips (despite the helpful winter veg section in Bon Appetit this month) and I wanted to test out Mrs. Seinfeld’s sneaky veg theory. There has to be something to the whole “Deceptively Delicious” (and the book that sued it) concept as I couldn’t tell there were parsnips *or* carrots in there…although my meatloaf was incredibly orange which made it rather difficult to tell when to remove it from the oven (Paula suggests to do so “when the meat is no longer pink”). I am a little nervous about next weekend’s game though. My family bleeds green and yellow. Although, then again, I suppose Eli & Co. could inadvertently avenge the Bruins in the ’99 and ’00 Rose Bowls (when UCLA lost to Wisconsin and my family rejoiced). It’s kind of funny — I had a Super Bowl “party” last year and everyone in attendance was rooting for the Bears and I felt sorry for the Colts, so I adopted mock affection of Peyton for a single night…and look what happened! Although, then again, I suppose Wisconsin’s part of my life whether I like it or not…once upon a time, I had a cheesehead. 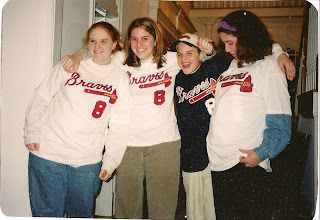 Remember when Javy rejoined the Braves on December 17 and I was really excited and I was looking for the photo from the Christmas in Atlanta when I gave my cousins and my sister Javier Lopez t-shirts? Well…I was cleaning my apartment today and found it on top of my refrigerator! I’m not *quite* sure what it was doing up there…unless I was planning to put it on my fridge and it either fell down or I just didn’t have enough magnets and I left it up there for safekeeping and forgot about it. But…all’s well that ends well, eh? And here it is! 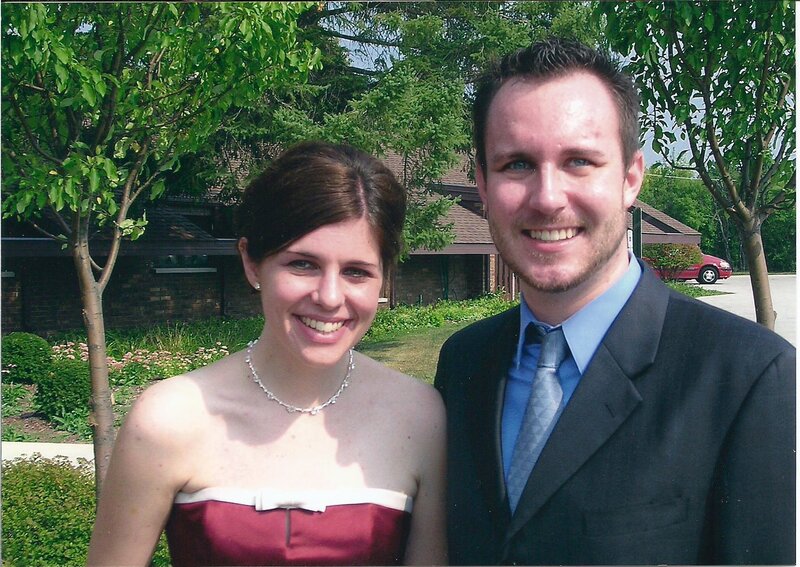 Look how young we look!